Full sister to beautiful Amalie, we chose to keep “Lana” out of the lovely triplet does produced by Mila in 2016, with the hope that she will mature as impressively as her sister. 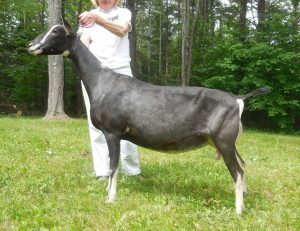 Like Amalie, she has the same length and levelness over the top line; Lana excels Amalie in rear leg angulation, and rear udder height. We chose to breed Lana to Zydeco based on the exciting results of Amalie’s breeding to him this past season, and we will again breed both sisters to Zydeco, as this is a combination that certainly appears to be working!